The first digger was built in 1896 from a child’s toy and was intended to be a penny candy vendor. It was an ingenious, totally mechanical, hand-cranked device. 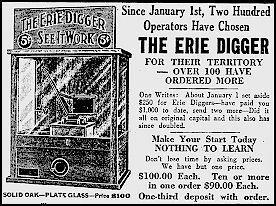 By the middle 1920s it was in full production as The Erie Digger and offered 1-cent or 5-cent coin slots. The miniature steam shovel was encased in a solid oak cabinet with glass windows on three sides and continued to be all-mechanical, using no electricity; not even an electric light. During the 1920s and 1930s many other manufacturers produced their own version of a crane or digger game, and most of these were electrically operated, and had virtually no element of skill. Some of the most popular were those manufactured by Exhibit Supply Co. of Chicago and International Mutoscope Reel Co. of New York, but there were many other manufacturers. With the proliferation of Slot Machines the Digger machines also became gambling devices. Clever operators learned to offer Silver Dollars, paper currency, and little bundles of coins wrapped in cellophane as the reward for lucky play. During the 1920s, through the 1930s and beyond, these games were very profitable for their operators, usually operating for 5 cents per play. They could be found in every arcade at amusement parks, boardwalks, and city parks. There were “Craneland” operations featuring diggers only. Digger games could be found in Drug Stores, Casinos, and in great numbers at State, County, and Worlds Fairs, and with traveling carnivals. Many makes and models were quite elaborate affairs designed to fit into the décor of the fine hotels and railroad stations of the 1930s. They became known as the “Hotel Models” and are the ones highly sought after by the discriminating collectors of today. Following World War II diggers began using large quantities of Japanese novelty items in the prize field to continue to cover-up for the coin and currency which was still being used as the real lure to play. The innocent looking, child’s toy crane was still actually a gambling device. By the end of the 1940s most diggers were charging 10 ¢ per play, and a number of large traveling operators now owned many machines, operating at multiple locations in units of 10 to 16 games each. William Bartlett operated his highly successful Miami Digger which became know as “Nickel Diggers”. Lee Moss, and Tommy Wells were well known for conducting their own, similar style of carnival operation, using original Erie Diggers. The operation of diggers changed abruptly, and forever, in 1951 with the implementation of the Johnson Interstate Transportation Act. This new Federal law made it an criminal offence to transport gambling devices across state lines, and all diggers were automatically placed in the gambling device category. The business of operating money diggers ended in 1951. The manufacturers of electric diggers turned their attention to producing other coin-operated equipment, but Lee Moss, of Hot Springs, Arkansas, who had purchased the Erie Manufacturing Corp. in 1946 along with his brother-in-law Tommy Wells, reacted with another plan . By 1951 they were operating over 40 traveling units of 12 diggers each and they had been put out of business by the Johnson Act. They immediately brought all of their equipment into home base. (The FBI quickly raided operators who did not cease their operations and their machines were seized and destroyed) Lee Moss then lead a small group of former carnival digger operators in a Federal lobbying campaign which went on for 2 years but was finally successful in changing the classification of certain types of digger games from “Gambling Devices” to “Amusement Devices”. Diggers could operate again, but only under specific guidelines. All electrically operated types remained illegal past 1951. Starting in 1953 diggers began their new life as carnival games exclusively; and only the mechanical (Erie type) were allowed under Federal laws. Gone were the coin slots. The player was required to pay for each play by handing money over the counter top, and the attendant activated the machine by pulling a string on the back of the cabinet. No cash money could be offered as prizes, and no prize could have a value of over $1. The charge to play could not exceed 10c, and they were only legal to operate at agricultural fairs and celebrations. From 1953 through the late 1970s the business of operating diggers was confined to traveling carnival operators, lead by a few gypsy businessmen who approached it as a legitimate enterprise. They had great success by paying-out high percentages of merchandise, and by finding many other new ways of operation to make the diggers even more fun to play. With a relaxation of Federal laws, mechanical coin slots began to reappear on digger games in 1974, and shortly thereafter the cost to play was raised to 25c. Finally, a twenty-year moratorium on coin-activated diggers was over, and by the early 1980s a new type of crane game invaded the U.S. from Europe. This new high-tech crane game virtually ended the old-time digger game business. 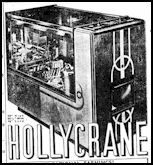 Large crane games which were controlled by solid state circuit boards and capable of picking up plush toys, swept across the U.S. They could be seen in every truck stop and Wal-Mart vestibule from coast-to-coast. Many of the early operators who put these games in operation did not understand the value of making sure that there were a lot of winners for the best kiwi real money pokies, and the public soon rebelled. This carried over to the diggers operating at carnivals and fairs. Once again, people came to believe that no one could win when playing a digger. By the mid 1980s the old time digger business was a thing of the past, but the smarter of the plush crane operators were learning to dispense a high percentage of quality merchandise, and they have now turned their crane operations into very successful profit centers – thriving on repeat business and die-hard crane players. There are currently many modern operators with routes of several hundred crane machines each, and there are a few large operators with thousands of machines in locations across America. After 100 years there are still “diggers”. They have come a long way from their birth as a penny candy vendor.